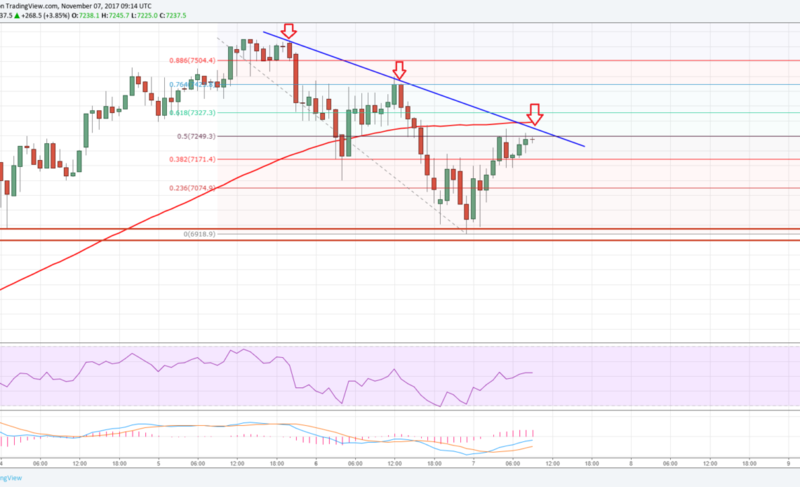 Bitcoin Price Analysis: Can BTC/USD Surpass $7300? Bitcoin price found sellers below $7600 against the US Dollar, and corrected lower. 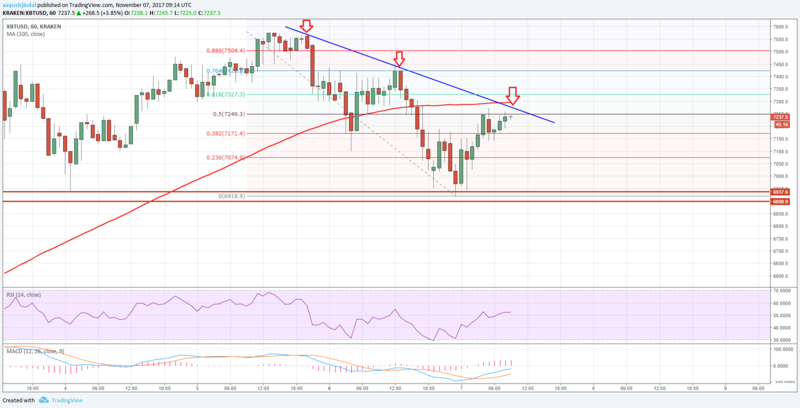 BTC/USD is moving back higher and is attempting an upside break above $7300. Bitcoin price is currently recovering from the $6918 low and approaching a major resistance against the US Dollar. There is a key bearish trend line forming with resistance at $7300 on the hourly chart of BTC/USD. The 100 hourly simple moving average is also near $7300 to act as an upside hurdle for buyers. There was a steady rise in bitcoin price as it extended gains this past week above the $7500 level to a new all-time high at $7572 (data feed by Kraken) against the US Dollar. Later, the BTC/USD pair started a downside correction and traded below the $7000 handle. The pair formed a low at $6918 before it started an upside move. Buyers pushed the price above the 38.2% Fibonacci retracement level of the last drop from the $7572 high to $6918 low. However, there is a key bearish trend line with resistance at $7300 on the hourly chart, which is acting as a barrier for more gains. The 50% Fibonacci retracement level of the last drop from the $7572 high to $6918 low is also at $7249, acting as a resistance. Moreover, the 100 hourly simple moving average is positioned at $7300 to prevent further gains. This means the $7250-7300 region is a major resistance zone for buyers. Should there be a break above the $7300 level, the price might continue to gain momentum. The next major hurdle is above $7400 and the 76.4% Fibonacci retracement level of the last drop from the $7572 high to $6918 low. If buyers remain in control and sentiment is intact, bitcoin can even retest $7500 in the near term. On the other hand, if the price fails to move above the $7300 resistance, there can be a downside reaction back towards the $7000 handle. Therefore, it depends on whether BTC/USD is able to break the $7300 resistance or not.